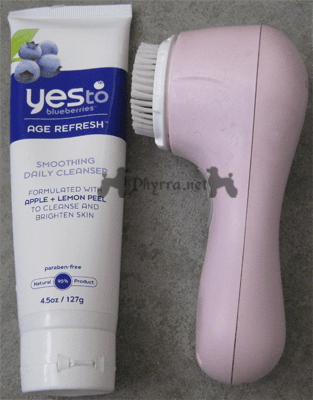 A while ago I picked up the Yes to Blueberries Smoothing Daily Cleanser to try out. Target had a bunch of stuff on sale in the Yes to line, and this looked good. Plus, I love blueberries. Blueberries are awesome. The collection features products that help improve skin firmness, protect skin, diminish fine lines and wrinkles, and nourish age-damaged skin. $9.99 for 4.5 fl. oz. For me, yes. This is a super creamy cleanser that I feel worked really well on my skin. It didn’t irritate it at all. After washing with it, my skin felt really smooth. I liked the results. I’ve had really upset skin due to winter and allergies, so I’d been using straight shea butter under my eyes and anywhere I’ve been sore and it really helps my skin when it’s dry or agitated, so I think the shea butter in this product is really fantastic. Mostly I’ve used this cleanser with my Clarisonic Mia and they pair together nicely. Yes, I would. I think it’s a great cleanser for the price and it’s my favorite cleanser out of all the ones that I’ve tried in the past six months. 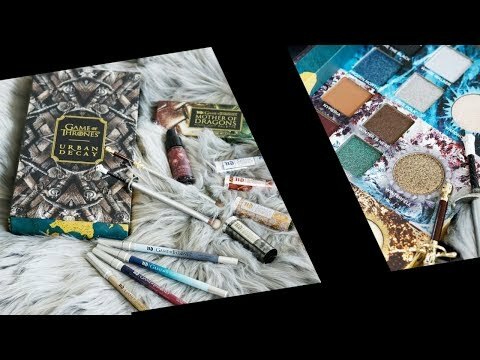 I’m really surprised by all the negative reviews it’s received on Drugstore.com and Amazon.com. I can only think that perhaps most people aren’t used to creamy cleansers. I know I certainly haven’t used very many (I think this may have been the first that I tried), but I really love the results from this one. Using this led me to try other products in the Yes to Blueberries line, which I’ll be reviewing. Have you tried any of the Yes to line, be it Carrots, Blueberries or something else? If so, what was your favorite? in the tropic? U really did make me enthusiast about it. It depends on your skin type. This one is working for me though it was the first creamy cleanser that I’d ever tried. I have sensitive skin so I don’t really try anything that isn’t within my dermatologist advice. Currently, I’m using a brand with activated carbon but I would also like to try this one too cause I need to avoid those wrinkles in my face. What does the activated carbon do? I haven’t used much, but I dig the cucumber wipes and the ‘Yes to Tomato’ Conditioner. When I have more money I’m looking forward to trying more! Are the wipes gentle for you? I saw this at Target and really wanted to try it because I love blueberries too (and creamy cleansers). But one of the first ingredients is Ethylhexyl Palmitate and that always causes me to break out (even in a cleanser). So I haven’t tried it:( I love their shampoos though (well the Yes To Tomatoes ones). I’ll have to try this! I looove creamy cleansers, even with oily skin. I’m a fan of Yes to Carrots haircare and lip balms. I haven’t tried anything else, but I’ve been eying the Blueberries line. I’m finding the blueberries cleanser and eye cream to be great for my sensitive, upset skin. I’ll have to try this out. I love their say yes to tomatoes cleanser, but their gentle exfoliating carrots one left me feeling dry. I’ve their cucumber shampoo and conditioner. I like the way it smells, and I enjoyed it. It left my hair felling soft, and I think that’s the one formulated for color treated hair. . . I’ll have to take a look because I can’t remember right now. I’ve also used their tomato body wash. That smells really great, and leaves me skin feel soft and refreshed. It went well with my sensitive skin until I used something else, and then went back to it. I feel ya on the weird skin. Mine can react to so many bizarre things. I really like the YTCu makeup wipes, I use those a lot. And I’ve been using the YTT face wash (for oily/troubled skin) lately. I was using OHWTO’s Black Magic face soap before that, but I ran out and had forgotten to order more, and needed something immediately instead of waiting for shipping, so I just ran out and grabbed a tube of YTT. (Actually, I first got Neutrogena Naturals Purifying Face Cleanser, but had a nasty burning-feeling reaction when I used it, so I had to go back out and get something else.) I really like it! My skin is super-oily, but YTT combined with Solstice Scents’ toner for oily skin and SoBe Botanicals cucumber cream moisturizer actually leaves my skin soft and moisturized without redeveloping my usual oily sheen within a few hours. I tried the YTT moisturizer a long time ago, but found it to be a bit heavy for my skin. I think I’ll have to experiment with more stuff from the YT* line, I’d forgotten they had masques and scrubs and stuff too! Definitely experiment! They’ve got some great products. I bought one of the little try packs where you get like 3 products from 20 dollars from target. I picked up the yes to cucumbers line. I LOVE the moisturizer (sad that this is the only not full size item. Only mini size 🙁 ), I can’t express that enough. It’s thick-ish, but not overly so. The cleanser – which is full size – is also very nice. It comes with an eye cream, which I don’t use too often, but it’s full size which will last me forever. it also comes with a little hair band thing to bring your hair back. I loved this little kit and NEED another moisturizer. The yes to cucumbers is for normal-sensitive skin, so I think I’m going to mix and match from the other lines. Yes to carrots for the exfoliator and yes to tomatoes for the mask. May have to check out blueberries now too! Yay glad you liked the Try packs. I hope you find one you like. I definitely think this one is good. Avon discontinued my favorite creamy cleanser, so I might give this one a try, thanks for the review! I really love Yes to Carrots shampoo and conditioner! I was using the same regiment in order to save my skin. It was destroyed (i.e. a lot of flaking and peeling) by the harsh winds off Lake Michigan and simply using a heavy moisturizer wasn’t doing the trick since my original cleanser just dried it out even more. After about two weeks, my skin was back to its smooth, oily self. However, I had to stop using it because it’s too much for my oily skin. It just leaves me feeling greasy. Therefore, I think this cleanser is best for those with dry skin. It’s working pretty well on my sensitive skin. I have a slightly oily t-zone. I can definitely see it being too much for oily skin on a daily basis. I’ll have to go buy this now!! I’ve been wanting to try out the blueberries one since I got to try the carrots and cucumber. I’ll be reviewing them after I’ve used them for awhile. Wow, this has been my skincare regimen exactly: Yes to Blueberries + Clarisonic MIA. I’ve been using it since December and it’s really helped some of the issues I had going on. We’ll see how my skin changes in the summer, but for now, I’m sticking with this. Yay! It’s great to hear that it’s working for you, too. I didn’t know about the Yes to Blueberries line! I’ve tried the Yes to Carrots lip balm, and I just bought the Yes to Cucumbers makeup wipes. Let me know what you think of the makeup wipes. They should be gentle? Thanks for reviewing this. I was afraid to try this after the YTC make-up remover experience I had ( which was similar to yours.) Oddly, the reviews on Amazon were fairly positive for that product… So I don’t know why they would be negative on this one. Hmmmm. I’m always curious when I really like something and I see reviews that are negative on it. It always surprises me. Yeah the makeup remove was bad as a remover, but ok as a cleanser. No idea why it couldn’t remove my mascara or eyeliner. I haven’t tried the yes to line, but I love cream cleansers so I must try to find this one! Speaking of shea butter, if you skin needs some extra tlc, why don’t you try one of mulondon’s moisturisers? They have shea butter and other emollients in them to calm dry and sensitive skin. Haven’t tried them myself but I just ordered one since the cold has wreaked havoc on my skin! I’ll have to check out Mulondon. Where is it carried? Right now I have pure shea butter, which is fantastic.